Put a colander over top of a bowl of some sort. Make sure that all of the holes in the colander are over the bowl. Line the colander with white paper towels, cheesecloth, or coffee filters. 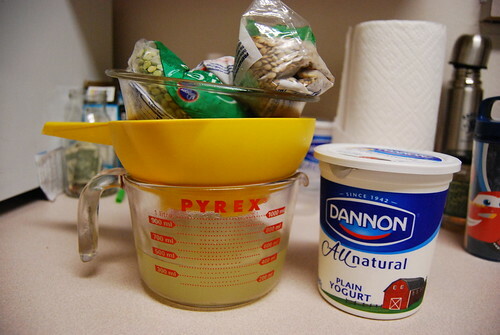 Pour yogurt into lined colander. Cover yogurt. I just used more paper towels. Put a bowl filled with heavy things-bags of rice or beans work well-on top of the covered yogurt. Leave in refrigerator for a few hours or overnight. Result? 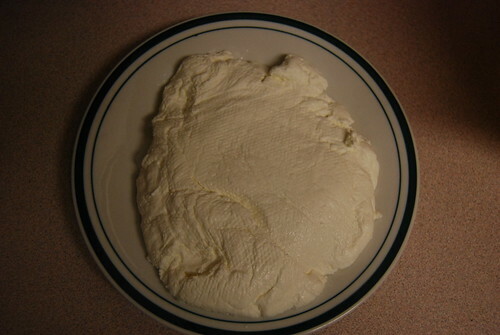 Yogurt cheese! At least, that's what Alton Brown calls it. Add a cup of blueberries and a couple spoonfuls of sugar. Whiz it with a stick blender and get this yummy Blueberry Decadence. It's so creamy and delicious! 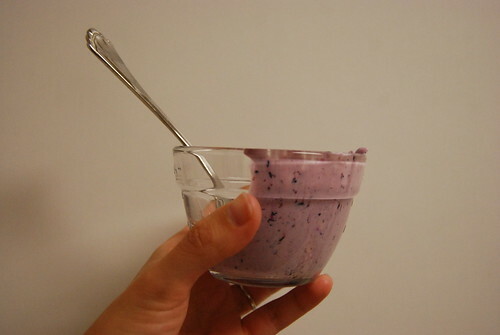 You can also throw it in the freezer to make fro-yo. YUM! This is how they made cheesecake in Africa.